A gracious two story, three bedrooms, two-bath cottage with a feeling described by guests as "like visiting grandmother's house". 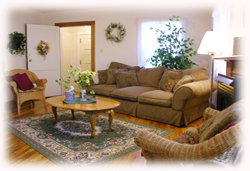 The large living room has cable/color television with VCR/DVD. An attractive gas fireplace adds to the comfort of the room. 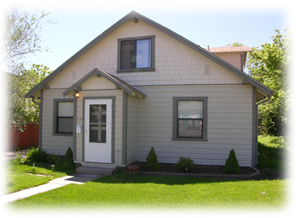 The back yard is large and we have provided a picnic table, lawn furniture, and a gas grill for your enjoyment. Many of the furnishings in the cottage are original pieces. The downstairs bedrooms share a bath. 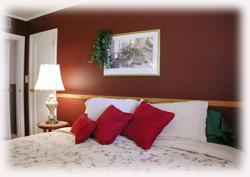 The cherry wood bedroom , decorated in greens & whites has a double bed. The maple wood bedroom, done in burgundy & cream has a king sized bed The upstairs bedroom is a "dormer room" with an English Country Garden feel. There is a private bath and sitting area as well as a TV/VCR. 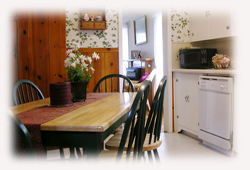 The cottage is stocked with breakfast foods for you to prepare at your leisure. The parlor is complimented by the large gas fireplace, the beautiful, highly polished wood floors, and the gracious furnishings. A comfortable and relaxing place, to call home. 710 W. Birch - a delightful little breakfast nook A spacious kitchen which is fully equipped; there is even a dishwasher. The dining table seats six and is a perfect spot to plan your next day’s adventure. 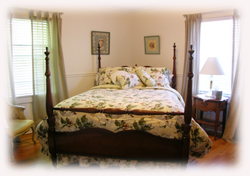 The front bedroom has a delightful cherry wood four poster bed done in greens & white with a down comforter. A truly relaxing room in which to sleep. Elegant and gracious, with a feel of times gone by, this bedroom has a king sized bed. Floral wall paper and a cream colored bedspread highlighted with throw pillows and a down comforter add to the comfort of this room. This spacious room is highlighted by the slanted ceiling. 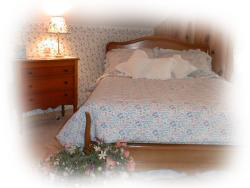 The double bed has a floral comforter with spring flowers. The down comforter and throw pillows add to the ambience of this spacious bedroom.